Nothing beats being able to directly see what you’re doing! Optical and fluorescence microscopy is perfect for wide-field characterisation and initial inspections. 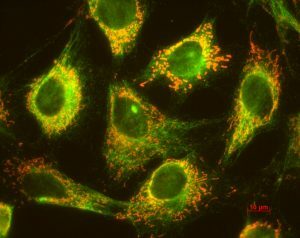 Optical and fluorescence microscopy can provide instant results for cell counting and in vitro viability studies. It is also often used to find the site of interest for more detailed analysis by electron microscopy. Fluorescence imaging gives selective information about different structures in your sample. 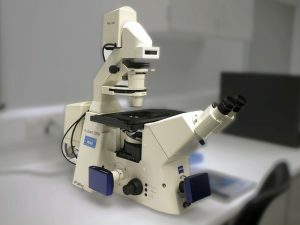 Inverted microscope suitable for slides and standard multiwell plates. Front and side mounted digital camera with wide of view. Axiocam MRC5 with 5MP high definition and 36-bit colour depth. Up to 630X magnification in oil, and up to 400X magnification in ambient conditions. Fluorescence filters include DAPI, FITC, Rhodamine, Texas Red and Set2 Ex 365/80. Download our current setup for full details.